As an amputee who often deals with phantom pain among other chronic pain issues, I found that meditation helps me deal with it. It's also a way to commune with Spirit. All of my creations are designed with a meditative mind. This distances myself from the "how-to's" and allows my spirit to freely create. 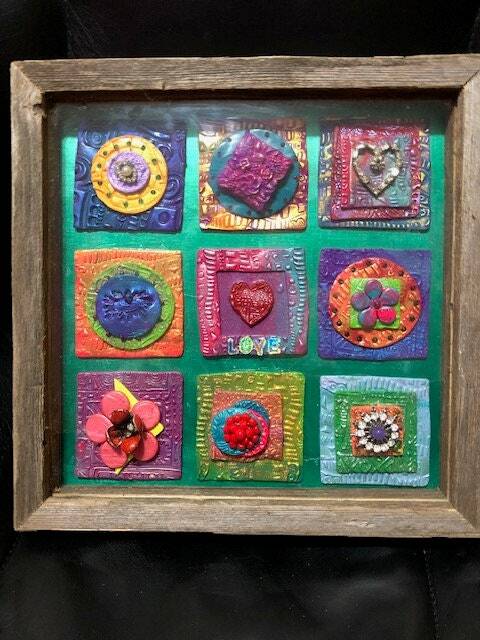 This includes this Polymer Clay Multimedia Quilt Wall Hanging. In the center is a tile with a framed heart with "LOVE" in colorful letters underneath. The rest of the board is quilted with 3D tiles of flowers made with polymer clay, colored wax, broken jewelry, Swarovski beads, and mika, and sealed with acrylic. The board is then enclosed in a gorgeous custom-made glassed shadowbox frame and ready to hang. It measures 11" x 11" x 1.5", with the frame. This one of a kind quilted wall hanging is only $58, plus shipping. Order now to guarantee availability. If you would like a wall hanging with a short custom saying on it, please convo me. I can place a tile anywhere on the board you wish with your custom words. * "Just when the caterpillar thought the world was over, it became a Butterfly"
* "Be the change you wish to see in the world"
* "Do not go where the path may lead, go instead where there is no path and leave a trail"
* 1st Corinthians "Love is patient, love is kind..."